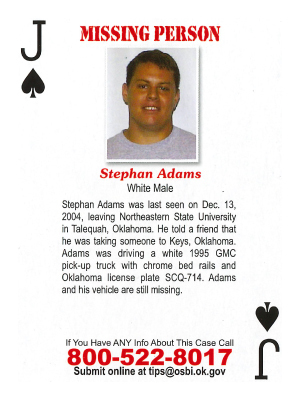 Stephan Adams was last seen on Dec. 13, 2004, leaving Northeastern State University in Talequah, Oklahoma. He told a friend that he was taking someone to Keys, Oklahoma. Adams was driving a white 1995 GMC pick-up truck with chrome bed rails and Oklahoma license plate SCQ-714. Adams and his vehicle are still missing.